A recent independent study from Northwestern University found that the timing of earnings calendar events impacts not only the performance of equity stocks, but also affects the pricing of options and options trading. This is how Wall Street Horizon has structured its delivery - it's all about getting the data at the speed and format you need. Traders and investors can opt for GUI, XML data feeds or low-latency streaming feed. For guidance on evaluating event data when researching alpha models or risk strategies, read our whitepaper Exploring Corporate Event Data and Volatility. 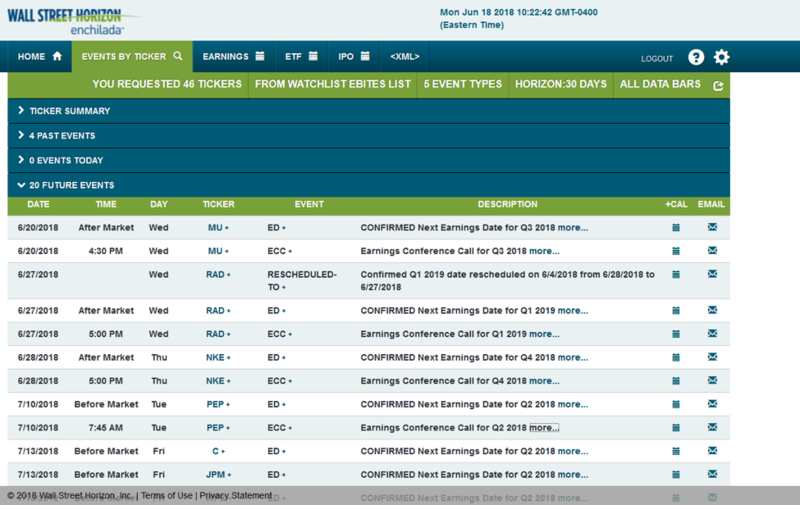 Our earnings feeds now include preliminary earnings announcements! Read our new whitepaper Extreme Ways: Trends and Consequences in Preliminary Earnings Events to find out why institutional investors need to examine preliminary announcements ahead of quarterly disclosures, assess the deviation and determine how it plays into or against typical communications and the strength of signal it may represent about upcoming earnings. As the corporate event surveillance experts, Wall Street Horizon knows too well how event data movement can make or break an investment strategy. According to the 2018 Corporate Event Research Survey, the majority the investment community polled by Wall Street Horizon needs to know when a company makes a change to any corporate event. The top two reasons reported were needing to track stocks on watchlists followed by trading on event changes. a buyback offering that is extended, with new terms. The data is provided in a variety of delivery formats to incorporate into your workflow and trading systems including: low latency streaming feed, on-demand XML data feed, API and via our web-based application, Enchilada. Revisions to earnings announcement dates and/or status, for example status change from "tentative" to "verified". Includes revisions to earnings announcement dates and/or status. In addition, alerts when the earnings announcement date crosses before or after the weekly or monthly contract option expiration.